One of the most amazing things about human consciousness is that we experience it as a holistic unified experience. As we interact with the world we see, hear, and smell. We remember. We feel. We think. It’s this seamless unification that makes us forget sometimes that all these processes that contribute to our conscious experience are actually separate and distinct processes in the brain. One of these days I’ll try to tackle the question of how these processes become unified, but today I want to explore a somewhat simpler question. What is the relationship between the senses and consciousness? Can you even have consciousness without sensory experience? This is a deceptively difficult question, so let’s start simply and take a short walk through a little thought experiment. If we took away any one of our senses, while this would drastically alter the nature of our conscious experience, it wouldn’t in any way remove our conscious experience. Blind people and deaf people are still conscious. This seems so obviously true that you might wonder why I even mention it, but we have to start somewhere. Let’s move on and make this more complicated. What if we take away ALL your senses? Imagine that you couldn’t see, hear, smell, taste, or feel anything. Not very easy to do, is it? And it shouldn’t be, because without our sensory systems transferring stimuli from the world outside our bodies, there would be nothing for our brains to integrate to create our conscious experience. But the difficulty in imagining this state of being isn’t the same as saying that there wouldn’t be anything that it’s like to be in that state being. You would still have your thoughts and memories and the lack of an external world couldn’t take that away from you. The underlying nature of this state of consciousness would certainly be mysterious to us. How would you know if you were dreaming or awake? Would you be living in a perpetual dream state? Would you even feel the passage of time? It’s arguably impossible for us to speculate on what this existence would be like, but I feel pretty confident in stating that it would be like something. And so while the questions about this senseless state of existence are many, few would deny the label of consciousness to one in this predicament. But we still haven’t been true to the original question we asked ourselves so far. Because for those thoughts and memories to exist in your sensory free consciousness, depends on a history of having intact sensory experiences to be able to interact with the world and develop memories and a thought process. Had you been born without a single functioning sense organ, there would never have been a chance for you realize your potentiality for consciousness. Think about a baby born without any senses whatsoever. What would be going on in its head? What could ever go on in its head? So while this potentiality for consciousness is innate to humans it is only through experience that this potentiality can be realized, and it is only through our sense organs that experience is possible. Without a means of interacting with the world around us, there is nothing available for us to think about. This “aboutness”, this intentionality towards the world is the mark of consciousness. So while Descartes was right (I think, therefore I am), let us not forget that to think, I must first sense. The relevance of this discussion may not be immediately obvious. But this very simple thought experiment actually tells us something very important about the necessary conditions for consciousness to arise (mind you, not sufficient). It is a boundary condition on our theories. It also implies a counterintuitive point. The cognitive sciences tell us that while sensory stimuli originate from outside the body, they are all turned into electrical signals in the central nervous system. We don’t actually experience the outside world, what we experience is these internal signals (an oversimplification, but useful enough for this conversation). The Matrix exploited this idea brilliantly, and set up a situation where characters experienced a false world, not by presenting their senses illusory experiences, but by stimulating directly the relevant areas inside the brain, bypassing their external sensory organs completely. But if I just said that sensory experience is needed for consciousness, how are these people consciousness? The answer is tied to the internality of our conscious experience. The important point about sensory systems above can be boiled down to a very oversimplified input-computation-output-repeat system. It is not the sensory systems themselves that are integral (in theory, in practicality, they are all we have), but rather that our sensory systems facilitate interaction. Since this interaction manifests itself as internal interactions within the central nervous system, we can conceive of bypassing these external systems, as long as there was a reliable way to stimulate the internal processes of the brain. This last point may be science fiction now, but it’s important to address the ramifications for consciousness if it was possible, since it presses our intuitions about consciousness, and thus helps us clarify some otherwise not so obvious facts. Exactly. You can’t uncouple the mind from the body and think that we are a ghost in a machine. We are defined by our interactions with the world and our reality is defined by our interactions with the world. Even our doubts about existence can only come about because of a sense of our senses. This understanding that you can’t separate the mind from the body actually has more real world implications than one might originally think. (or sense!) Realizing that no mind, or person, is an island is a transformative thought for science, politics, sociology and philosophy. It is an idea that I am sure many would rebel against, but by rebelling against it, you only prove the argument of interconnection truer! Agreed completely Tony. And there is actually some pretty astute philosophy in your reply that much of the philosophical community ignores (wrongly in my opinion)! I strongly agree with the thought experiment presented and the conclusion “Without a means of interacting with the world around us, there is nothing available for us to think about”. If one began their life without senses they could not think and so are not concious, the life-form merely reacts chemically and physically with its environment. Therefore is it an important question to ask at what point in our ancestry was conciousness first established? From the simple compounds first found on the Earth, through to the first formations of DNA and to human beings today, some point exists where ‘life’ begins from ‘non life’, as Prof Dawkins would put it (skip to 8:15 ). (If that hyperlink doesn’t work then … skip to 8:15 in the following youtube video http://www.youtube.com/watch?v=vueDC69jRjE&feature=player_embedded#!) !! Fantastic question! One without an easy answer. A glimpse lies in where we would go once we accept that interaction is at the root of consciousness. But as you point out, interaction alone is not enough. What you are looking for is the emergence of “representation” in organisms. An organism can interact with it’s environment, differentiate one environment from another without being “aware” of anything. This interaction can function like a simple switch. Thermostats, alarm clocks, lawn mowers, bacteria and viruses all interact with their environments and yet we don’t think any of them are conscious. This is because they have no way to “represent” the outside world, only interact with it. I argue that representation is emergent in interaction, but defining how representation works and what physical structures are involved is no easy task. 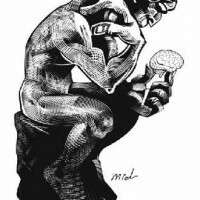 Cognitive science is currently unable to deal with this sort of question, and actually, many of the prominent theories in cognitive science will most likely eventually have to be discarded because not only are they unable to account for representation, they explicitly contradict any theory that takes representation at the level of the brain seriously. As a clarification of this concept of representation. Think of the visual signal that hits your retina. many theories talk about this as “representing” the outside world. But this signal does no such thing. It’s just a wavelength. For it to represent anything takes a knower able to understand what it is. When it is converted to an electrical signal in your brain, it STILL doesn’t represent anything, because again, you need a knower to understand that signal. But there is no little knower in the brain, no homunculus, that receives this electrical signal and understands it. Explaining how representation, awareness, understanding, can emerge from the non localized ongoing process of internal central nervous system interactions is at root to explaining the phenomena of consciousness. I’m hopeful that the field will solve this problem in my lifetime, but it may be a mystery that sticks with us for some time. as an addendum, it’s also worth noting representation alone also won’t get us to what we think of as consciousness. Lower level organisms might be minimally aware of their environments, have representations, but not be fully conscious in the sense we normally use. I think consciousness is a graded phenomena, and particularly our ability to use language sets our mode of consciousness apart from all other species (and even young children). To continue with the theme started above, the interaction that language allows is in some way the cause of a deeply rich conscious experience unattainable otherwise. The word consciousness itself is often times problematic and not quite rigorously defined! I revisited this question and situation after lot of thought about consciousness. I think it is quite tough to know anything about it with absolute surety. However, what has been established is that there are two aspects to Consciousness – One is the Content and the other is Level. When one is asleep then what remains is a reduced level of consciousness with almost no content of consciousness. The senses are in a suspended mode and unless the input from the senses is not considered as a priority or life threatening the reduced level of consciousness continues. So it is obvious that level of consciousness is irrespective of the sense organs. Infact thinking from a slightly broader perspective, life is said to have started way after the big Bang, so in a way Big Bang is the beginning of everything. If Consciousness is the key to life then it should have existed even before the Big Bang and in a way could have been the cause for the Big Bang. So the level of Consciousness is not a function of the content of the consciousness, sense organs or no sense organs. Hi Raja, I believe you are confusing the necessary conditions for the development of consciousness, with the necessary conditions for continuation of consciousness once it has developed in an organism. Of course we don’t need our senses once we have developed consciousness, as I point out in the original post. You could remove all of your senses right now, and you’d still have internal consciousness. But my point is that you need those sensory apparatus to first be able to develop consciousness. Without that sensorimotor interaction, consciousness would never emerge. To your latter points, your jump from consciousness not needing the senses to function, to consciousness existing before the big bang and even causing it, has no justification. At least not in the context of your above words. Let me try and understand what you are saying and then, let me try and explain what I was attempting to say. The consciousness that you are attempting to define is I think, restricted to the birth cycle of an organism. That is, when an organism is born it is without any consciousness. As and as through sensory inputs it experiences the world a consciousness is developed. In a way the sensory inputs are also creating memories and ensuring continuity to the developed consciousness. After such process has taken place and after such memories have been formed if for some reason the organism was to lose faculty of its sense organs and any form of sensory inputs was to be cut off, the consciousness would still continue as it has already developed. In short the memory of sensory inputs that develops consciousness will ensure continuity of consciousness and I will exist as I was before my sense organs stopped functioning. If for some reason a person were to be born with a complete disability of non-functional sense organs then, there would not be any chance for the consciousness to develop and the person would not have no semblance of an “I”. I hope I got what you are saying please correct me if I didn’t get it yet. Now let me come to what I was trying to say. I say that whatever you are talking about while is agreeable but is only talking about “content of consciousness” without touching the factor of “Level of Consciousness”. For example when a person is in sleep the sense of I vanishes any memories vanish and sensory inputs also are suspended. Yet, there is a level of consciousness that can be aroused with inputs from sensory organs and the level can be further increased through various ways that don’t essentially involve a need for sensory inputs. In most of the spiritual pursuits, level of consciousness is what is given more importance than content of consciousness. Most of the self-help books, if I could say so, stop at the content of consciousness, however they also are strongly drawing on religious and spiritual masters who have given more importance to level of consciousness. In this regard most spiritual practices talk about the ultimate truth and pure consciousness which is a level of consciousness that is untouched so far by thoughts hence memory. Consciousness is the ultimate goal of human life as per many and yet life started after many million years of matter being created post Big Bang. Matter, Life and Consciousness all seem to be strung together in a confused maze. However if Consciousness is the ultimate goal then consciousness should have preceded life, preceded matter hence preceded Big Bang. So the pure consciousness should be a field, timeless, non-experiential and omnipresent! Can you even have consciousness without sensory experience? A senseless state of existence. it hard to find answers and proper conclusions that I am satisfied. But I commend you Greg for writing this article and also for all those that comment. So I just focus on the sensory organs and leave consciousness out. not see the wind. I only see the leaves move, I cannot see the wind. Using this invisible emptiness to sail ships to other lands. when all the senses disappear? When all the memories, thoughts, fantasies and imaginations disappear? Have I been this way all along? If I still exist after all these things leave, then what am I before they came? Am I the same after they leave? No matter how many movies projected onto the theater screen, the theater screen still blank. It still remain clean and untouched and empty. The senses did not create or change me. I don’t know what create me. Can the senses tell me, or reveal to me what I am? Therefore what use are the senses? What are our senses used for? I assume, humbly, that the senses are used to experience what I am not. Therefore, I am experiencing what I am not; and from experiencing what I am not, I am simultaneously experiencing what I am. I don’t know about that. I’d say that by the time an organism is born it is already conscious, due to the sensory interactions that take place while the organism is in the womb. It might be a very minimal type of consciousness, but I’d say it’s probably there. Then as an organism develops and engages in richer interactions, consciousness itself becomes more meaningful. Organisms that can develop language use and symbol manipulation, I think, develop an even richer level of consciousness that allows for self reflection and self awareness, meta-knowledge, etc. I wouldn’t call it the memory of the sensory inputs. In fact, memories, per say, are not relevant to what I’m trying to say. I would say that the past interactions of the organism, which were able to occur given its sensory apparatus, set up a certain causal dynamics in the system, such that were those sensory apparatus to be taken away at some later point in time, the causal dynamics remain such that the organism can be conscious without those continued interactions. The internal interactions are now sufficient. But if you removed all memories from the organism as well, would it still be conscious? I’m not sure. Without sensory experience there is no phenomenal feel of the world around you. And without memories, you can’t conceptualize at all. What would be the nature of thought without anything to think about or anything to feel? It’s not clear to me. But I’m willing to not take a hard line just yet on the matter. So the first part of your response, I could likely agree with. Or at least, nothing so far bars me from disagreeing with it. What does it mean to say that consciousness is a goal of life? Why should it have proceeded life and matter? Maybe we’re talking about two different things here. When I talk about consciousness, I grant that there might be multiple levels, but whichever level we’re talking about, at root, what I’m referring to is some sort of subjective experience. Is that what you’re referring to?